The Boston Celtics managed to hold off the Cleveland Cavaliers on the road without their star point guard, 103-96. Kyrie Irving missed the game, along with Marcus Morris and Aron Baynes, but again the return of the "Hospital Celtics" led to yet another victory. 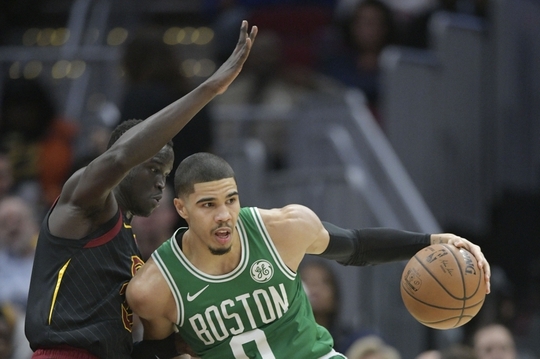 Jayson Tatum was superb as he led the team in scoring with 25 points, nearly half of which he got from a perfect night at the free-throw line as he took 12 of the teams 14 attempts. He shot 46.3% from the floor and tallied 7 rebounds and 2 blocks in a solid night on both ends of the floor. Gordon Hayward showed us more flashes of his old self as he had one of his best performances since donning the Celtic green. Hayward scored 18 points on 9 of 14 shooting with 6 boards, 5 assists, and a pair of steals and his athleticism on both ends was even more impressive than his stats in the box score. Marcus Smart stayed scorching hot from three as he hit 4 of his 5 attempts from deep en route to a 17-point effort on the offensive end. For the Cavs, Collin Sexton had a big night with 27 points, 4 rebounds, and a trio of assists, while Alec Burks chipped in with 21 points for the home team. The Cavs stay scrappy throughout the game though, staying within striking distance until the final minutes. The Celtics were able to hold on late and walk away with the win on the road.